The Jimmy Butler situation in Minnesota is so unique and fascinating. The 29-year-old asked to be traded before the season and here we are, less than a month into the season and he's still a member of the Timberwolves. Butler has a public perception of being a bad teammate over the course of his time in Minnesota and that's part of the reason why some think he wants out. 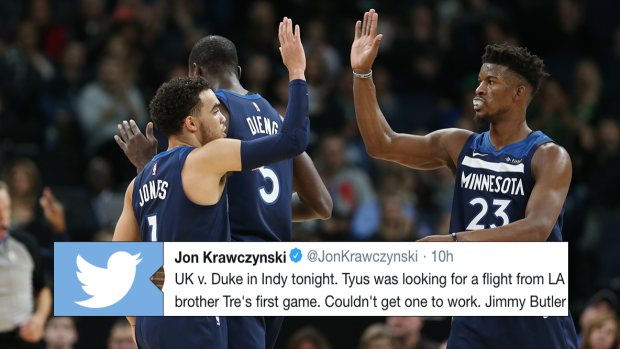 Perception and reality don't always much, though, and what Butler did for teammate Tyus Jones shatters the perception many have of him. Say what you will about Butler, but he came through for Jones so he could watch his brother play and that's the sign of a good teammate in our books.